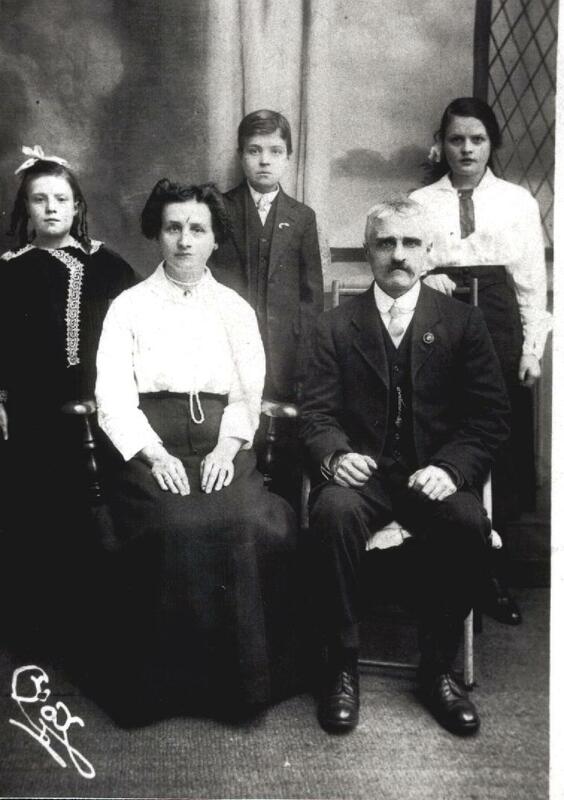 This photograph which was printed in 1910 shows John and Hannah with three of their children. Probably Edith, Eliza and John. This Photograph was taken by M. Fox of Mansfield at 85 Layton Avenue. John was a collier and his sons Daniel and John William also worked as colliers in the local mines. The family moved from Shirland for Mansfield Woodhouse to work in the Nottinghamshire Coal Fields at Sherwood Colliery. John William met and married Mary Peat of Mansfield Woodhouse, moving to Church Warsop in the 1920's to work at Warsop Main Colliery. 59 Portland Street, Mansfield Woodhouse, Mansfield, Notts.